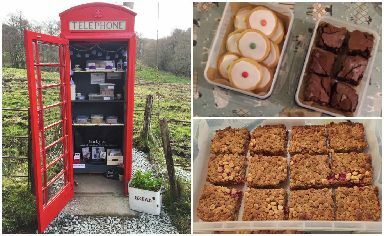 An old disused phone box in Cladich, just a few minutes from the Blue Cottage, has been imaginatively restored and transformed into Scotland’s tiniest shop selling locally baked cakes and crafts. With the addition of shelves and a fresh lick of red paint, the phone box has been renamed ‘Cakes in the Call Box’ by local bakers Holly Ford and Bron Campbell, who opened their enterprise last month (May 2017). Holly and Bron bake delights such as mini lemon drizzle cakes, millionaire shortbread, raspberry blondies, custard creams, gluten free brownies, dairy free empire biscuits and cupcakes, and keep an eye on what is selling well in order to keep up with demand. Payment is made via an honesty box, overlooked by the local Highland cows, the world-famous Cladich fold, in nearby fields. We’ve visited ‘Cakes in The Call Box’ and think it’s a brilliant idea. The cakes are delicious and the crafts for sale, like locally home-made cards, are equally special. What’s more, it’s planned to open year-round. We’re telling all guests booking a stay at The Blue Cottage to be sure and swing by.